This Bosch integrated washer dryer retails at £779 so is one of the more expensive machines in the range. It has a washing capacity of 6kg and a drying capacity of 3kg meaning a non-stop wash/dry cycle will handle 3kg of clothes. The variable spin speed ranges from 600 rpm up 1400 rpm making drying easier as a large percentage of the water is spun out. 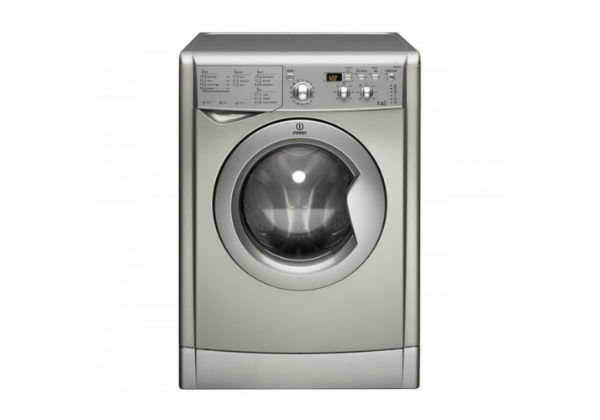 The machine has an energy efficiency rating of B which isn’t bad for a combo; it enjoys a washing performance rating of A and spin performance of B. At 1400 rpm the noise level is 74 dB which means it is a pretty quiet machine. Dimensions are height (H)82.0 x (W)59.5 x (D)58.4 cm. Key features are a fully electronic dial control for programming the machine, which would help arthritis sufferers as it also so light to use; and time selection options including timer delay and lengths of programme cycles. Other features are an Aquatronic wash system – a safety system which redistributes weight inside the machine to stop clothes getting caught or snagged or otherwise damaged. The machine also has a child lock, and a multiple water protection to protect against leaks and floods. Customers described the BOSCH EXXCEL WKD28350GB integrated washer and dryer as really well made, good looking, quiet to run, just at 57db generally, and very good at washing and drying. Customers who had purchased the machine had not a single significant gripe about their purchase. Nearly everyone was pleased with their Bosch and being so well made and tough and attractive looking that it is likely the machine will last many years. BOSCH machines have a history of longevity. The LED control panel shows speed and time of spin, temperature and minutes left till the end of the cycle.